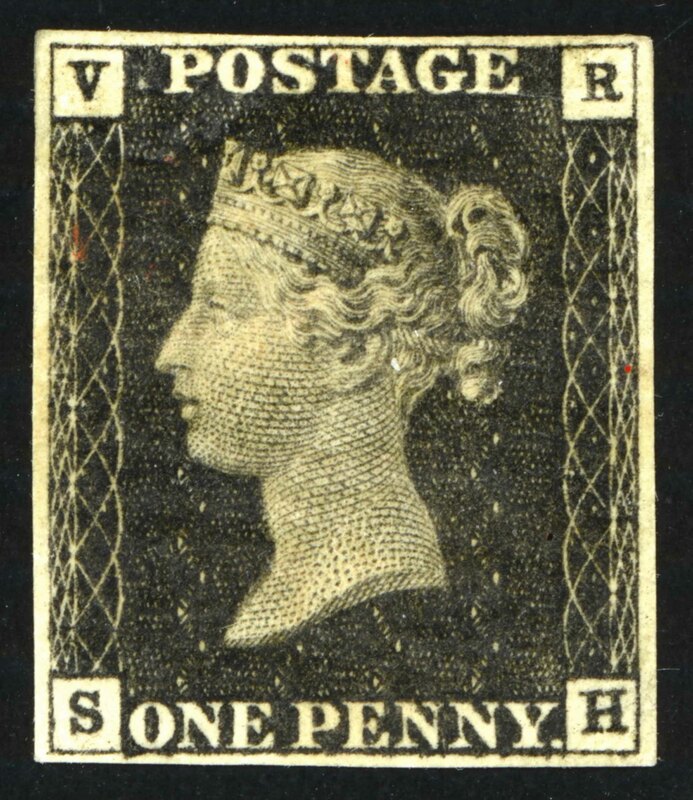 The 1840 One Penny Black VR Official – a new discovery – trial cancel in RED. The VR officials differ from the normal 1d blacks. They have the letters VR in the upper corner instead of the usual stars. The 3323 sheets printed were intended for use by government departments but this proposal was abandoned. All but 21 sheets were destroyed. Most were used on Postmasters’ notices. Relatively few stamps survived and they are catalogued by Stanley Gibbons at £25,000 upwards. An example which we acquired from a collector recently is lettered ‘SH’ and has the only listed re-entry of the VR Officials. The bottom frame line shows the re-entry clearly in the enlargement below. As such this is a very desirable item. However all is not as it seems……. The collector had been sold it as an unused example. While it is fine and genuine with good margins without gum, it is NOT unused. As can be seen in the enlargement, there are small traces of a red ink, the most apparent being in the lattice below the V. This red is consistent with the ink used for Maltese cross cancels. Also the entire stamp has a shiny glaze over its surface. It would normally be a matt. This appears to be a previously unknown example of a red cancellation removal trial. The Post Office was extremely concerned about the loss of revenue if stamps could be cleaned and re-used. Rowland Hill used part of a sheet for such trials. Stamps were cancelled and official attempts made to remove the cancels with various chemical agents. The Stanley Gibbons QV specialised catalogue suggests such trial cancels were only in black. This one, clearly in red, was very close to a completely successful removal. This example is usual in another respect. The surface is coated with a clear varnish or similar. With the value at stake, I’m not planning to subject it to intrusive tests to determine its true nature! The coated stamp is affixed to an ‘envelope’ and duly cancelled with a red Maltese cross. Normally, the red ink would soak into the matt surface and be near impossible to remove. However, the varnish largely prevents the red ink touching the absorbent stamp surface and it could more readily be cleaned off using a solvent for the ink but not the varnish. In this example, there is close to 100% success. The traces of red are small and it could have been re-used with little risk of detection. After all, the dealer had sold it as ‘unused’ and he didn’t have to check it in dim gaslight. Had this same stamp been cancelled in black, the small residual amounts would be totally lost against the black of the stamp. It is probably that the same result could have been achieved with a coating of gum Arabic or similar. Here soaking would remove the cancel and the gum. Many ‘unused’ examples may well be trials with completely successful removal of the cancellation.